Welcome the legend that is Daen Brown. 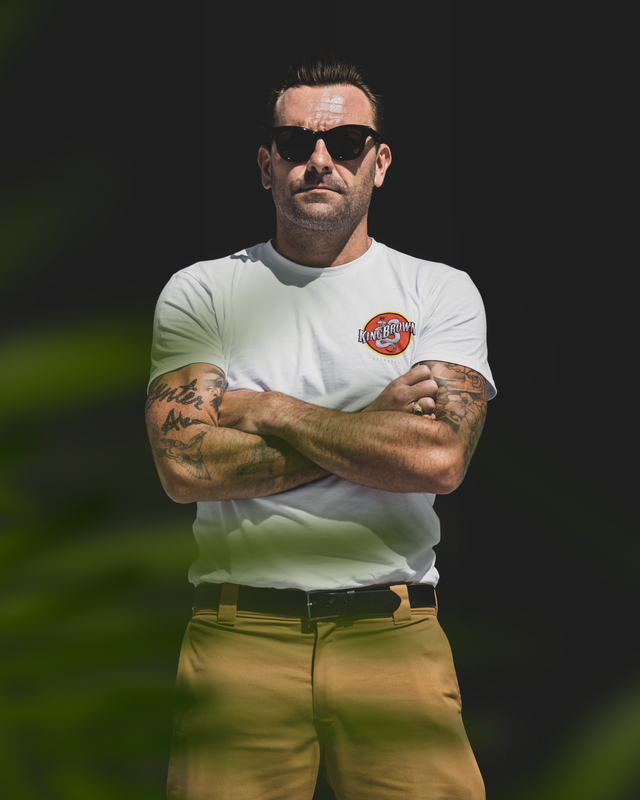 A familiar face around this part of town, a rep for Dickies and the owner of Kingbrown Pomade. We thought he was too cool not to have a chat to. Have you always been a local to the Goldy? Where did you grow up? I’m Port Macquarie born but was raised north of the border on the mean streets of Palm Beach from the age of 4. I did a stint in Sydney from 2007 - 2012 which was great. When the kids came along we made the call to move back to Palmy. How long have you been wearing Dickies for? What do you like about the brand? I’ve been rocking the brand since my teen punk days back in the 90’s. My personal style has obviously has changed since then but that’s part of the reason why I love the brand as it’s so timeless and easy to make your own style be it punk, vintage, street and everything between. Tell us about Exit 92 and how that started. Exit 92 is my wholesale fashion agency, which I started when I moved back to QLD some time ago. Essentially, it’s a platform to partner with like-minded brands such as Dickies and assist them into the consumer market. 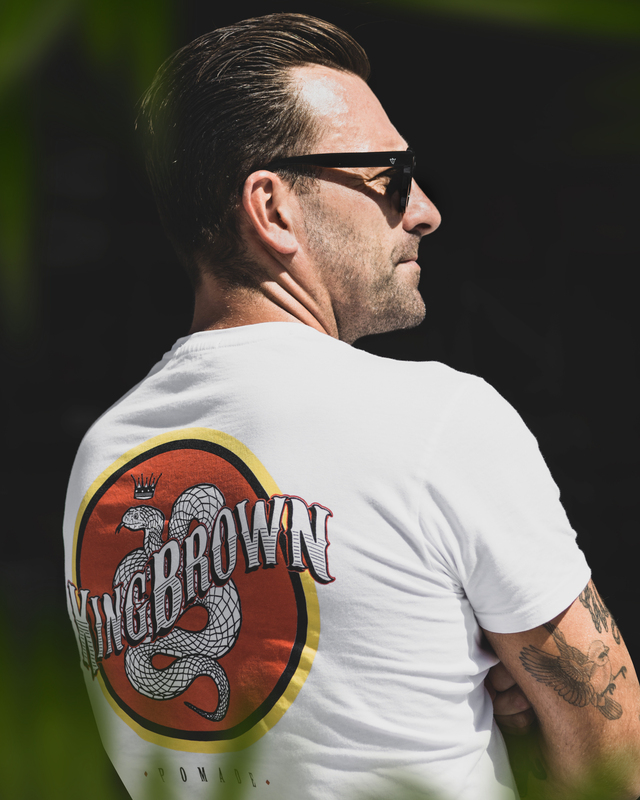 You also own King Brown Pomade, how is that going? What’s planned for this year? Correct, I started KB with a mate of mine 5 years ago, stoked to say the brand has been really well received both domestically and abroad. We’re putting lot of focus on expansion in Europe, USA and Canada this year along with releasing a couple new products. How long did it take you to form the products / packaging from concept to market? Initially it took 12 months to get our first product to market, and anywhere from 6 -10 months for each additional product. We concept and develop all our own formulas and packaging, so the process can be drawn out at times. Is the product being sold in other countries? Indo has a huge bike/barber culture, have you thought of growing the brand there? We sure are, too many places to name but we’ve developed a wide reach globally. We have sold a lot of product direct to stores in Indo, but we currently don’t have a distributor in the region. Dean from MAFS likes the product, Could this be a new target market? Ha-ha…Yeah that was a surprise to see the product featured so heavily on that show. Apparently, it had 1.87 million viewers!! My phone #lit up when it was televised. I didn’t realize so many people were into it. Ha-ha. No plans for any reality TV star product endorsements but I’ll take the free exposure on that one. Got any new projects / plans in the works that you could share? I’m heading to the UK in June for barber trade show and shop tour. We’re also partnering with your good selves at Dickies to do an exclusive jacket give-away in coming weeks! I’m obsessed with poke bowls and biltong. Coopers green long necks are my go to but also loving what’s coming out of Philter brewing in Sydney. Psyching on the Led Zeppelin reincarnation group Greta Van Fleet. Keep the body healthy and the mind will thank you for it! Thanks Daen! You can check out King Brown's Instagram Here!